Are you having mould and condensation issues in your home? Condensation is a problem that affects all types of buildings, new and old, it is caused by multiple factors such as poor ventilation, high humidity from daily household activities, poor building design or heating systems. The condensation is a pain but the mould it causes has health implications that cannot be ignored, it is easily treated and it doesnt have to cost a fortune so get in touch today and we can go through options with you. 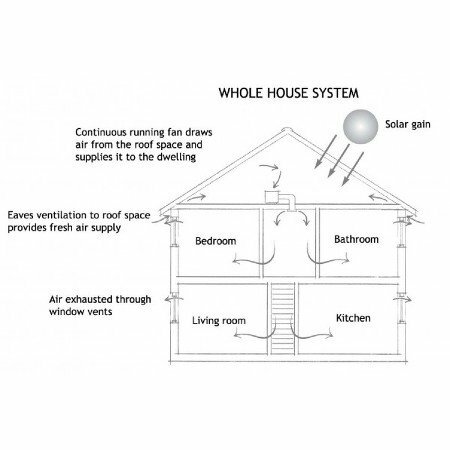 Positive Input Ventilation uses air displacement to ventilate a whole house, thereby improving the air quality and preventing condensation problems within your home. This Condensation Control unit is specifically designed for use in existing properties. A single fan unit that is mounted in the roof space (central location for flats) supplies fresh, filtered air into your home via the hallway or landing. This creates a slight positive air pressure that pushes stale, vapour-laden air out via air gaps or through humidity sensitive window vents. The PAM PIV Loft Unit consists of a fan with connector duct and ceiling diffuser. This fan will run continuously, only switching off when the temperature in the loft exceeds 25C. The reason for this, is above this temperature and the hot air coming in would be unpleasant and uncomfortable for the occupants. The unit will turn back on once the loft is below 25C. Heat recovery mode harnesses the benefits of solar gains (times when the air is hotter outside compared to inside) when temperatures are between 19C and 25C. The ceiling diffuser has been aerodynamically designed to direct incoming air along the ceiling. This is where it mixes with warm, buoyant air before re-circulating downwards. This ensures a more even thermal gradient between the floor and the ceiling. There are many health benefits connected with PIV technology. Dampness causes secondary damage to buildings. Unwanted moisture activates the growth of various fungi in wood, causing rot or mould health issues and may eventually lead to sick building syndrome. Stains, from the water, salts and from mould, mar surfaces. The highest airborne mould concentrations are found in buildings where significant mould infestation has occurred, usually as a result of severe water intrusion or flood damage. Moulds can grow on almost any surface and occur where there is a lot of moisture from structural problems such as leaky roofs or high humidity levels. Airborne mould concentrations have the potential to be inhaled and can have health effects. Energy Saving : Supply-air taken from the roof space is slightly warmer than outside air so can provide some energy saving compared with a conventional extract system. Low Running Costs : With its DC fan, the HomeDry PIV Loft Unit is extremely energy efficient, costing from as little as 1pence a day to run. Minimal Maintenance : Replacement of the long-life filter is only required every 5 years (if extremely soiled) otherwise you can hand wash in warm water and hang-dry. Aerodynamically designed diffuser : The diffuser is designed to direct incoming air along the ceiling, thereby mixing with, re-using and re-circulating high level warm air.